Northeastern region of Thailand or what Thai people refer to as ‘อีสาน Isan also Isaan, Isarn, Esan, or Esarn’ is the largest part of the country. You might hear the official term is “ภาคตะวันออกเฉียงเหนือ pàak dtà-wan-àwk-chǐang-nŭea”. The main language is Isan, which is a dialect of the Lao language. 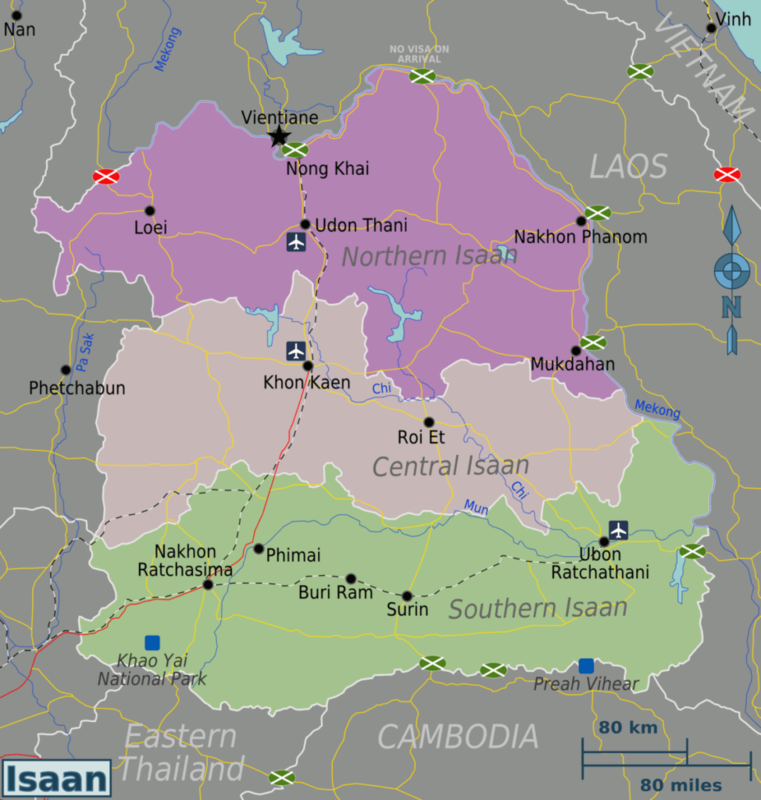 Isan belongs to the Chiang Saeng and Lao–Phutai language groups, which along with Thai are members of the Tai languages of the Tai–Kadai language family. 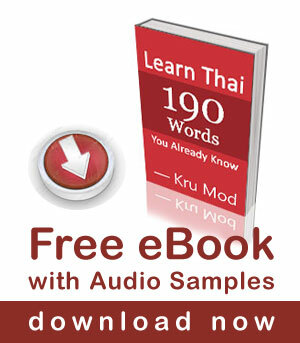 Thai is also spoken by almost everyone and is the language used in education. Khmer, the language of Cambodia, is widely spoken in areas along the Cambodian border: Buriram, Surin, and Sisaket. Teacher Pear is from Maha Sarakham province (จังหวัดมหาสารคาม), one of the 77 provinces of Thailand, located in the northeastern region of Thailand. Neighbouring provinces are (from north clockwise) Kalasin, Roi Et, Surin, Buriram, and Khon Kaen. It is the home of Mahasarakham University, the largest university in northeast Thailand. Most of the workers in Bangkok such as taxi drivers, servers, street sellers are from Isan region. We think if you have some basic knowledge about Isan dialect, it could be fun for you to express a small Isan conversation with people you are likely to encounter. This lesson teacher Pear is teaching basic words, phrases and sentences from Isan dialect. If you already have basic ideas of central Thai dialect, learning Isan should be easy, you only need to learn new vocabulary while the structure of the language remains the same. เจ้าเป็นตาฮักแถะ /jâo bpen-dtaa-hák tàe/ = You are lovely. แมนบ่ /maen bàw/? = Is that right? มักบ่ /mák bàw/ ? = Do you like it? เจ้ามักอาหารไทยบ่ /jâo mák aa-hăan tai bàw/? = Do you like Thai food? อยู่ไส /yùu săi/? = Where? จังได๋ /jang dăi/? = How? ตอนใด๋ /dtawn dăi/? = When? เป็นหยัง /bpen yăng/? = Why? for this excellent lession. I have a lot of fun. Thank you Kruu Mod and Kruu Pear. Thank you very much for these Isan lessons. I am motivated to learn Isan because my wife is from Udon Thani Province and speaks Isan as her native dialect. None of the language schools in Udon teach Isan so your online lessons are really useful. For your next Isan lesson, I would suggest something around the situation of meeting a stranger on the street and asking directions. Another idea would be a lesson based upon popular Isan songs. I really want to learn your language, im Nam , Im Thai people from Viet nam. Anyone wondering why, so far, only men have responded here? How about you, Mod? It’s sad, so sad. I was so happy that I can learn isaan from your video isaan 101, this video is very useful and wonderful, i really hope can learn isaan from you again, hope to see or receive your second isaan 101 video. Can you tell me what “mah da sai” as a question means in issan dialect? I am sorry I have no idea because I don’t speak Isaan dialect. I will ask Kru Pear about this. Teacher Pear is from Maha Sarakham. It is in the northeastern Thailand. I am from Nakhon Si Thammarat a province in Southern Thailand. I am note sure about this sentence without hearing it or reading it in Thai. I assume it could be “มาจากไส maa jàak săi” which means “where are you from?” or “where did you come from?”. What an extremely helpful video! Heading from Chiang Mai to Isan this weekend. Going to try to communicate better! Thank you. Jao can also be used as a polite particle like khrap and ka, no? I always hear the ladies at the coffee shop by my condo say: Sawasdee Jao or Khorp khun jao. The coffee shop is based on Chiang Mai theme. Really good to understand i have been living in so isaan sakon nakon for 2 weeks so i will need to speal thai……..
is isan grammar and thai grammar are same? Do you know one ? Wow, thanks. I was learning basic Thai and was wondering why different words were being used. Your video was Very Informative !! Thank you so much. I will be in Udon Thani and Ban Muang in a few weeks from now.